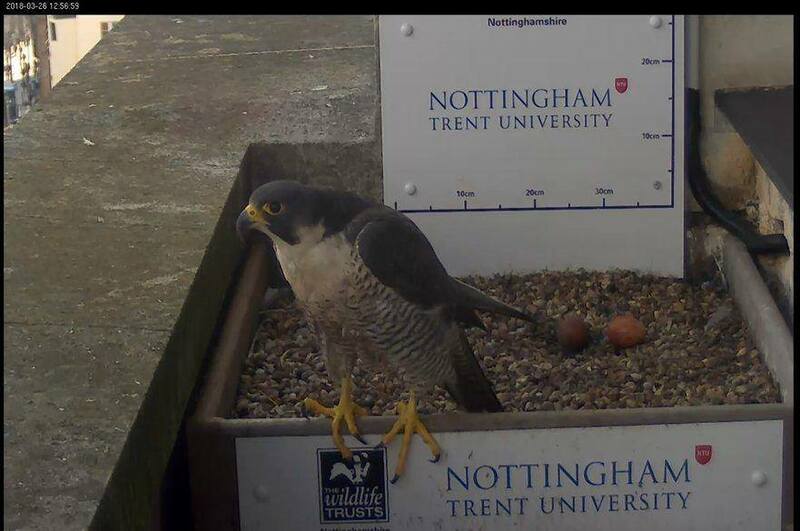 More than a week after the first one, NTU's resident peregrine falcon pair finally welcomed their second egg at 7.20am on 26th March. Follow the previous egg's arrival early on 18th March, there were grave concerns for the health of the female, known as Mrs P by webcam watchers on dedicated Facebook pages. She had been showing signs of trying but failing to pass the egg, suggesting she was egg-bound which is potentially fatal. Thankfully, she eventually passed the egg and both birds have been sitting on the two eggs so we will all be keeping our fingers crossed that her health has improved and that the eggs are viable. Falcons usually lay eggs every couple of days and the longest gap between the 2017 eggs was 59 hours and 23 minutes, so this eight-day gap has come as a surprise. It may be that this is effectively the first egg of a new clutch and that the original egg is no longer viable, as the parents have alternated between incubating it and leaving it uncovered. We therefore cannot be certain of what is in store for our falcon family, but you can keep an eye on the action as the story unfolds by viewing the webcams. Thank you to all the online viewers and Nottinghamshire Wildlife Trust for the health updates, images and videos.